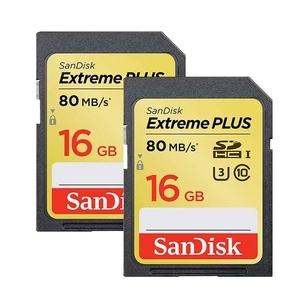 Sandisk Extreme Plus SDHC Memory Card (Class 10) - Twin Pack. SanDisk Extreme PLUS SDHC and SDXC UHS-I memory cards offer enough speed, capacity, and durability to meet the demands of advanced photographers and passionate shutterbugs alike. Ideal for use with advanced cameras and HD camcorders, this card offers data speeds up to ten times faster than an ordinary memory card1 ensuring you'll never miss the moment. With read speeds as fast as up to 80MB/s, this card unleashes the full shooting potential of your advanced camera or DSLR. Take advantage of advanced functions such as fast action shots, continuous burst mode and multiple frames per second. Photos are written to your card almost instantly so you'll get your best shot, and you’ll save time moving it all from your camera to your computer. 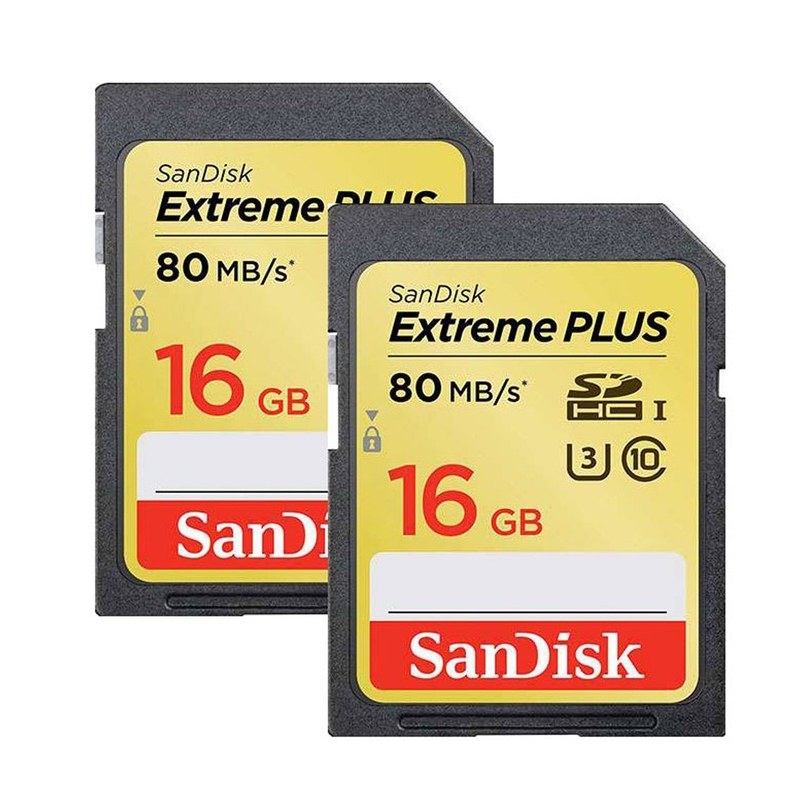 With capacities from 16GB to 64GB to capture it all, this SanDisk Extreme PLUS UHS-I Card offers enough room for thousands of high-resolution photos. The card can accommodate high-volume image formats, such as RAW and JPEG, without running out of space. This memory card also provides plenty of room for Full HD videos. With Class 10 and UHS Speed Class 3 (U3) video ratings you'll be ready to capture cinema quality 3D and Full HD video (1920x1080x30fps), which require more performance than ordinary cards can handle. This memory card's accelerated minimum sustained write speeds ensure no video data is lost during recording, by reducing dropouts and stuttering. Designed and tested to withstand the toughest conditions, all card capacities are waterproof shockproof and X-ray proof. It can operate in temperatures ranging from -13 to 185 degrees Fahrenheit, so you can snap the perfect shot in almost any climate.